Kiddy & Junior Classes asbl/vzw - Who are we? Since 1980, our aim has been to allow young 18-20 yr olds to begin their professional and academic life with a solid linguistic grounding. We receive your children and give them the opportunity to learn six languages: English, German, Chinese, Spanish, French and Dutch in groups and all other languages in private lessons (for one or more children). Being here for our learners is of great importance to us and we do everything we can to help and motivate them throughout their language courses. Kiddy & Junior Classes has 16 classrooms all fully equipped with wi-fi. Our centre is located 10 minutes on foot from Schuman station, close to the business district and European institutions. Kiddy & Junior Classes is located slightly removed from the wide noisy avenues of Brussels, in a quiet traditional town house, ideally suited to study. 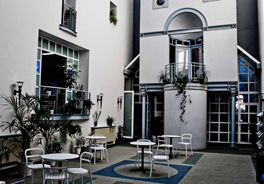 Our students come into the centre through the stunning entrance of the Art Nouveau Maison Van Dyck to be welcomed in our light and spacious Atrium designed in the style of Modern Art. EN 1974, elle s’installe à Bruxelles où elle saisit l’occasion, à 24 ans, de prendre la direction de l’école de langues qui deviendra LSI Bruxelles.